Daily Illuminator: Sign Up For The Moop’s Monstrous Mailer Today! February 7, 2017: Sign Up For The Moop’s Monstrous Mailer Today! Making more munchkinly monsters is Moop's main motivation! 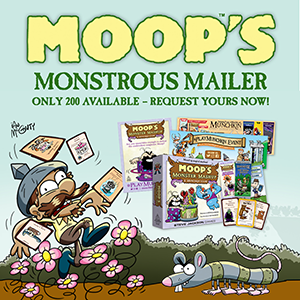 We are sending some lucky shops a Moop's Monstrous Mailer! Store owners and managers can sign up to receive a collection of exclusive cards, unique bookmarks, a demo game, and a handful of posters. But sign up soon; there are already fewer than 30 kits left! On March 3, 2017, these stores will be invited to host a #PlayMunchkin event where you could win some of these promos! So, munchkins, masterfully manifest at your friendly local game store to meet this magician!